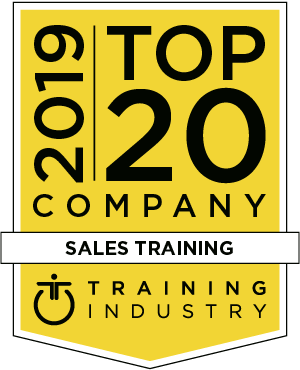 The 2019 Top 20 Sales Training Companies list recognizes the top sales training companies in our industry. These leading companies all provide outstanding service, and a proven track record for delivering superior sales training and improving the impact of the sales organization. Trying to find the best sales training solution for your company? Don’t miss Training Industry’s upcoming report, “The State of the Sales Training Market,” for an in-depth analysis of the sales training market. Sign up here to be notified when it’s released. The Sales Board is a leader in the delivery of tangible revenue producing training products for traditional sales forces, customer contact teams and sales leadership. Our primary mission is to improve the sales culture of our client companies. RAIN Group is a global sales training and performance improvement company focused on helping clients unleash their sales potential by delivering transformational experiences. We've helped hundreds of thousands of sellers, sales managers and professionals in more than 73 countries significantly increase their sales results. Imparta is a multi-award winning global sales training company that operates in close partnership with the sales organizations of many of the world’s leading brands. The company is a leader in the development of learning technologies that support and accelerate the development of best-in-class sales organizations, and offers an integrated solution that goes well beyond simple training interventions. GP Strategies offers sales programs and program management services that include learner experience design, collaboration programs, tailored delivery across all modalities, customer loyalty programs, event management, and expanded global trainer support. PMI provides consulting and training services to assist clients in the design, development and deployment of value selling and strategic account planning management (SAM) solutions. PMI’s unique approach provides customized and integrated solutions consisting of value selling/SAM processes, best practices, skills and tools. Sandler provides sales teams and business leaders with the tools to create replicable, predictable sales processes, while focusing on the whole client and emphasizing behaviors and attitudes. 270 global offices deliver training and coaching by full-time certified trainers, plus online tools reinforcing the training experience 24/7. Wilson Learning partners with its clients to create customized sales processes, transform sales forces into problem-solving experts, and launch initiatives that drive positive revenue performance. We get the job done together through our world-class team of experts who ensure our clients deliver measurable results. Global B2B companies come to us when they want to develop and deliver messaging, content and skills that are research-backed and tested and proven to drive success in the most important moments in the customer life cycle. Customers build and deliver marketing and sales conversations that address why buyers buy rather than how sellers sell. Richardson is a global sales training company focused on helping clients drive revenue and grow long-term customer relationships. Our 40-year market-proven sales and coaching methodology combined with our active learning approach ensures that sales teams learn, master and apply new behaviors when and where they matter most — in front of the buyer. BTS is a global professional services firm focused on the people side of strategy. The BTS sales and marketing practice helps its clients implement initiatives and sales transformations. We do this by embedding the behaviors of great sales reps into the daily workflow of the entire sales force within your organization. Every year Mercuri International empowers companies in over 50 countries to achieve sales excellence. We serve our clients both locally and globally with customized solutions and industry expertise. We grow profit through people, providing the tools and processes to tackle any sales challenge. We help salespeople make meaningful contributions in the places that matter most, showing them how to achieve greater influence through closer, more rewarding relationships. For over 100 years, Dale Carnegie has been improving the financial well-being of people around the globe, forming a more compassionate, engaged sales and leadership culture. ValueSelling Associates is the creator of the ValueSelling Framework®, a proven formula for accelerating sales results. The ValueSelling sales methodology uses a conversational approach to make complex selling simple, scaling to any deal size while focusing on the buyer. Miller Heiman Group is the global leader in providing organizations sales methodology plus sales technology to drive revenue and change business outcomes. The company’s training, consulting, technology and research solutions align process, people, tools, data and analytics to prepare sales and service organizations for the future of selling. Here at Janek we leverage years of research and experience to help sales organizations unleash their true potential. Our comprehensive sales training and coaching solutions prepare our clients to develop stronger, trusted relationships and equip their sales reps with the tools, skills and behaviors required to compete in today’s marketplace. We help companies build world-class sales teams. We use a unique blend of award-winning sales training and coaching, acclaimed sales methodology and technology that produces sellers who typically outperform individuals trained in a traditional classroom. With 37+ years in sales training, we have trained over 50 percent of the Fortune 500 companies. For 30 years, Sales Performance International has helped leading global companies drive revenue and sales growth through a focus on creating lasting behavior change for sales organizations. Our unique integration of globally proven curriculum and performance technology creates a continuous improvement system for enterprise sales organizations. Integrity Solutions helps create customer-centric, values-driven sales leaders and teams. Our belief is that 80 percent of sales success is based not on product knowledge and basic selling skills but on the salesperson’s values, beliefs, attitudes and motivation. Integrity and trust are at the heart of everything we teach. Founded in 1977, The Brooks Group is an award-winning sales training company focused on bringing practical solutions to improve and maintain overall sales effectiveness. Comprehensive sales assessments are used to optimize sales hiring, and sales and sales management training programs are customized to meet an organization’s specific needs. As part of our commitment to continuously monitor the training marketplace for the best providers and services we announce the 2019 Sales Training Companies Watch List. The 2019 Sales Training Companies Watch List is intended to help buyers of training services evaluate sales training providers, representing emerging or unique strengths or capabilities. Due to the diversity of services included in sales training, no attempt is made to rank the top companies. Sales Readiness Group (SRG) is an industry-leading sales training company. Our mission is to help improve the performance of sales teams by providing customized, skills-based training programs that produce sustainable behavior change. Our solutions include comprehensive sales training, negotiation, coaching, and management programs. For more than 40 years, Carew International has cultivated its reputation for sales training that delivers dramatic improvement and sustainable ROI for client organizations worldwide. Carew’s award-winning programs address core competencies, functional and interpersonal skills, and specific processes for optimal business development. Forrest Performance Group is a solutions-based training company focused on mastering the art and science of human performance. We're focused on customized solutions for any business and any circumstance to increase sales and create leaders who change the fabric of their companies. With the recent integration with their strategy execution solution, FranklinCovey’s sales training offering touches the vital parts of the sales process and gives new perspective to how goals, targets and results can be achieved. FranklinCovey continues to provide valuable and actionable sales training solutions. DoubleDigit Sales helps sales teams perform significantly better. Drawing on their extensive library of proven content and tools, they leverage their streamlined design process to deliver highly relevant and compelling learning experiences to improve sales results. Lastly, they engage leaders to embed behaviors and effectively drive change. Revenue Storm® is a global sales training company employing the latest in behavioral science to enable salespeople to reach and exceed their goals. Our singular focus is to improve our client’s sales effectiveness with higher win rates and revenue growth. Force Management specializes in sales transformations that increase revenue, improve margins and gain market share. We don’t just tell your sales teams what to do. We work with you to provide the how, helping map your plan to success. Our proven process drives bottom-line impact. We help organizations develop great people. Our constant stream of innovative sales simulations brings an incredible amount of value to our clients and challenges our competitors in the industry to bring their own innovations and evolve from "canned" learning experiences to immediately actionable, relevant and customer-specific learning content. There are a lot of great and large sales training companies in today’s marketplace. What is missing is someone who addresses the truth that if your decision-maker is emotionally closed, even the greatest pitch and product will always fall short 100 percent of the time. ASLAN is a sales training firm that addresses that elephant in the sales world today. New Velocity empowers sales teams to become the superstar versions of themselves. We teach sales professionals best practices and repeatable techniques in a fun, easy to learn environment. We are passionate about optimizing behavior change within a sales force. VantagePoint is the only company that offers research-based, diagnostic-driven, situational sales solutions that help you build an agile sales team. Our diagnostic identifies the unique situations each company’s salespeople face. Then, by leveraging the practices high-performing sellers use to win, we equip all sellers to be situationally fluent. Custom Learning Designs (CLD) is a sales training company that helps pharmaceutical, biotech and medical device trainers change patients' lives through more effective learning. Mandel is the global leader in technology-driven communication skills training. Available in 14 languages and across 75 countries, Mandel’s transformative skill-building approach is agile and easy to customize and deploy. With flexible, technology-driven delivery options, Mandel is the leader in anytime, anywhere communication skills training. For every salesperson, surviving today’s business acceleration requires “4.0” selling business intelligence and skillset. Cegos develops personalized and engaging learning experiences, which fit their agenda, their business and their culture. Locally and globally, we are continually striving to increase the business performance of our clients. CustomerCentric Selling® is a sales process hundreds of organizations have implemented. Its foundation is built on research on buyer behavior. Sellers learn to migrate from product sales to call on executives and focus on how offerings can be used to achieve desired business results. We recognize buyers would rather be empowered than sold.